Just call me Johnny-Come-Lately. I don't believe that Whatever Happened to Baby Jane is exactly an obscure picture; still, I never bought or rented it, never had a chance to see it until last night. Its reputation had, to some extent, scared me away. 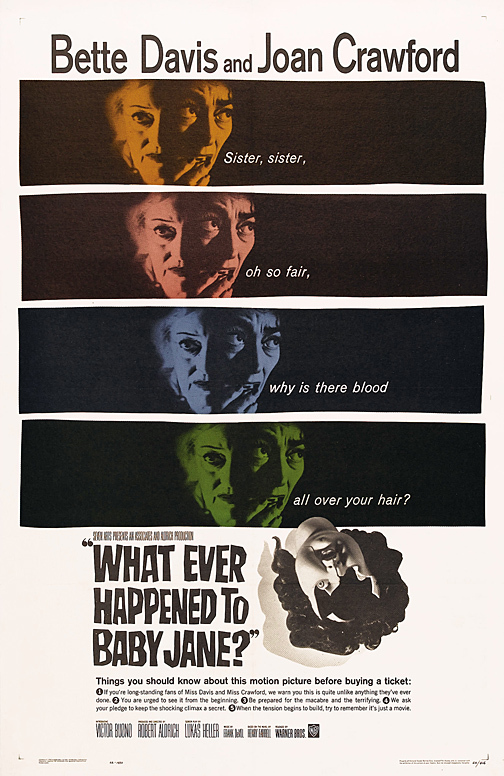 I like horror movies that don't draw blood, and Baby Jane was made at a time when cinema was starting to Play Rough. If I ever knew that Robert Aldrich was behind Baby Jane, I'd forgotten it. So when his name appeared my level of trepidation went way up. Aldrich is not exactly known for pulling his punches. He's made a couple of movies that I admire (especially the downright savage Emperor of the North Pole, with Ernest Borgnine and Lee Marvin squaring off atop a racing train), and he's made one that I actively detest (The Dirty Dozen); so I knew that this could go either way, and either way I knew it was going to be mean. In the end, part of the fun is looking back on how many times it made me shout "Oh my God!" out loud. My hackles were raised a bit when they ran clips from an early Bette Davis picture and then dumped all over her acting. Just had to keep telling myself "They're not talking about Bette, they're talking about Jane!" Shortly thereafter, things are literally set into motion, and from there this becomes a plain excercise in squirmishness. Crawford still looks great here, I believe the right word is "handsome," the lines around her eyes only adding character to her face. She does her job -- making us forget what we saw in the prologue -- extraordinarily well, playing us in exactly the same way that she plays her housemaid, to the woman's doom. There are hints at the truth here and there: especially in the way that she leans on that damn buzzer; but her fear is so genuine that she manages to land the ball of our sympathy firmly in her court. As an aside, could this movie have been the one that actually doomed her career, rather than re-invigorating it? From here on, it was a descent into ever more trashy horror pictures, and, as my friend FlickChick has pointed out, ever more horrific eyebrows. Davis, on the other hand, is nothing short of courageous in her willingness to take this far, far beyond the comfort zone. In Jane, she gives us a classic Movie Monster for All Time, every bit as chilling when she is trying to seduce the hapless Victor Buono as when she is perpetrating all manner of deviltry on her sister. Hideously wigged, powdered and rouged, Jane is Miss Havisham on steroids and Viagra, not just chewing the scenery but ripping it to shreds and making us like it in the same way that we "like" Karloff's Frankenstein monster or King Kong leering through a hotel window with his rolling eyes. You don't want to believe it, but you can't help but believe it -- Grey Gardens, anyone? Stuff like this actually happens. I don't know what secret part of herself Davis had to dredge up to give this performance, and I'm not sure I would have wanted to be living with her while she made this picture, but this is Greek tragedy cut loose, and what we are seeing here is a plain Force of Nature. Somehow, Aldrich manages to use a fair amount of predictability against us. When Jane brought that first lunch tray into the room, I thought to myself "Oh my God. It's going to be the bird." And it was the bird, although it was no less shocking to have my suspicion confirmed. The same exact pattern recurred with Davis's line, "Did you know there are rats in the basement?" Maybe the right word is not "predictability," but "expectations." Aldrich carefully allows us to see what is coming, and when he serves it up it does not disappoint. This includes the overall structure of the movie and the "shocking" twist of the ending, which isn't so much shocking as a kind of confirmation of what we knew all along: that this was a family tragedy in which there were no wholly innocent victims and no wholly guilty parties. Although that Jane is one world-class Looney Tune. On another level, the picture was personally difficult for me to watch. Even when the kind of issues that these two girls have with each other are not present, there is a certain dynamic in the relationship between an invalid and a caregiver. I don't want to make this post another confessional about my alcoholism or the terrible toll that the amputation of my mother's right leg took on both of us, but there were difficulties, as, I think, there are in any relationship of this kind. Whatever Happened to Baby Jane pinpoints the stresses, difficulties and fault lines to be found in these kinds of relationships -- and then throws gasoline on them. One of my entertainment pleasures these days is discovering old films that I should have seen, but never did. Working my way through a lot of Hitchcock that way. BABY JANE is one of those I've not seen, but based on your description and response ... sign me up!